John Barbier grew up in the Loire Valley in France, where his family had been making wine for the past 150 years. Maison la Belle Vie (French for “House of Beautiful Life”) had its first vintage from the 4.5 acre vineyard in 2006 that included Merlot, Cabernet Sauvignon, Syrah and a Vin de Peche made from a Muscat grape aged in peach leaves and peach wood with a slight sweet finish, which is a traditional wine in the Loire Valley. Three years later the winery was open to the public and the wait was well worth it. Mr. Barbier’s experience and expertise in winemaking as well as an intimate knowledge of the arid high-desert region of western Colorado has helped in Barbier’s transition from growing fruit in France, to Colorado. The age-old practice of “dry-farming” is still used today in their vineyard allowing them to achieve maximum results by adding to the complexity and flavor of the fruit. Maison la Belle Vie Winery respects their vineyard and those who supply them grapes. They strive for a minimalist approach with their wine so the content of the bottle will always reflect an unmanipulated purity for the grape to shine. 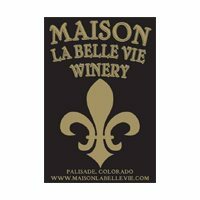 In 2011 Maison la Belle Vie added 3 Reserves, a Merlot, Syrah and a Petit Verdot all aged for 4 years and a walnut liquor that is a must have for the port lovers. Maison la Belle Vie (French for “House of Beautiful Life”) is a 4.5 acre vineyard, winery and wedding venue. Growing premium quality grapes such as Syrah, Merlot, Cabernet, Marechal Foch and Muscat. Since opening its doors in 2009 Maison la Belle Vie Winery has quickly become the place to be. The winery is currently producing 1000 cases and is moving to 3000 cases in 2012. 1 mile west on G road off Hwy. 6. April to October everyday from 11-6pm (except for major holidays). November to March 11-5pm Sat and Sun.